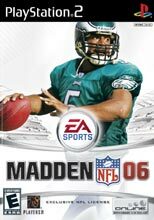 The biggest problem with Madden 06 for the Xbox 360 is that it feels like a step backward in the series. Rather than taking advantage of all that the Xbox 360 has to offer, the developers took the predictable step and scaled down Madden considerably. They took out many gameplay modes and many in game features and options that made Madden what it is. However, knowing EA, this was expected. What they obviously plan to do is save these features that Madden fans came to expect from the current-gen titles and slowly inject them into future releases of the Madden games on the next-gen. Basically, what this means is that gamers will have to go through the whole process of waiting for Madden to get better all over again. What have you done, EA?! Let’s talk about the good first: Madden looks good. Yes, obviously, this is the best looking Madden game ever made. Character models look more realistic than ever before and are just gleaming with authenticity, stadiums are true to their real life forms and make the gamer feel as if they are really playing there, and the crowds have been improved a step up from their usual non-existant paper machete forms. Even more impressive is the arsenal of animations that Madden now comes packed with. There are thousands of new animations in Madden 06 that previous iterations of the game did not have. From tackling to running to jumping to throwing to catching, Madden 06 is simply filled with great animations that cap off its realistic look and make it feel like a great game. Gameplay wise, know that Madden 06 is not simply a port of its console brethren. No, it has been completely reworked and is an entirely new – and worse – game than those that can be found on the current-gen consoles. The controls and core dynamics of the game remain the same, indeed, but the game feels completely different due to the fact that many of the features and controls that gamers loved have been removed. Namely, defensive alignments and playmaker have been removed. No longer can you bring up the secondary to show blitz or pull off for a deep pass, and no longer can you audible a blitzing linebacker back into pass coverage. Why EA removed these are unknown, but it makes the customization before snap basically impossible and it simply isn’t as much fun and isn’t as strategic as before. Additionally, offensive shifts have also been removed, leaving only hot routes and motion in the player’s arsenal. Arguably the only new addition that is actually any good is the new play calling screen. This new screen is drastically improved over anything found in current-gen versions of the game. The best part about the new play calling is how it’s organized. Now you can get a coach’s suggestion as well as Madden’s suggestion, sort a play by formation, type, or even the go-to receiver. This is very useful if you have one main player on the team, such as a Marvin Harrison or Randy Moss. Madden 06 just turns out being the bare roots of what Madden is on the current-gen consoles. The game is a let down in many respects. There was so much hype building up to the next-gen football games and Madden made an extremely poor showing. Hopefully future games will learn from its mistakes.